In Maureen Tara Nelson’s 18+ years in the dating industry you might have seen her on many television shows, seen her interviewed on many news channels, heard her live on the “Jackie The Joke Man Martling” Radio Show and “DeVore & Diana Show”on Sirius Radio, and on WGBB with Frankie D, or read about her in the many articles about her success as a Matchmaker over the years. They all share the same common theme, that Maureen Tara Nelson really cares! She loves what she does and it shows in your results! 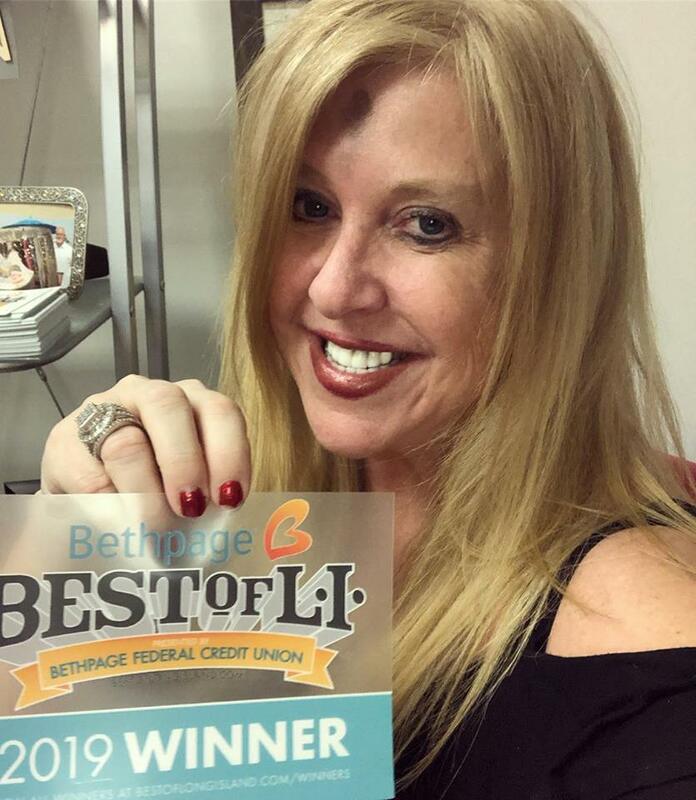 She has been written up in many Long Island Papers and Magazines, such as Newsday, Long Island Golf Magazine, Long Island Press, The Long Island Pulse, The Irish Voice, The Irish Echo, Home & Away, North Shore Today, The Boulevard Magazine, The Union Business Directory, Generations, and The Queens Courier to name a few. 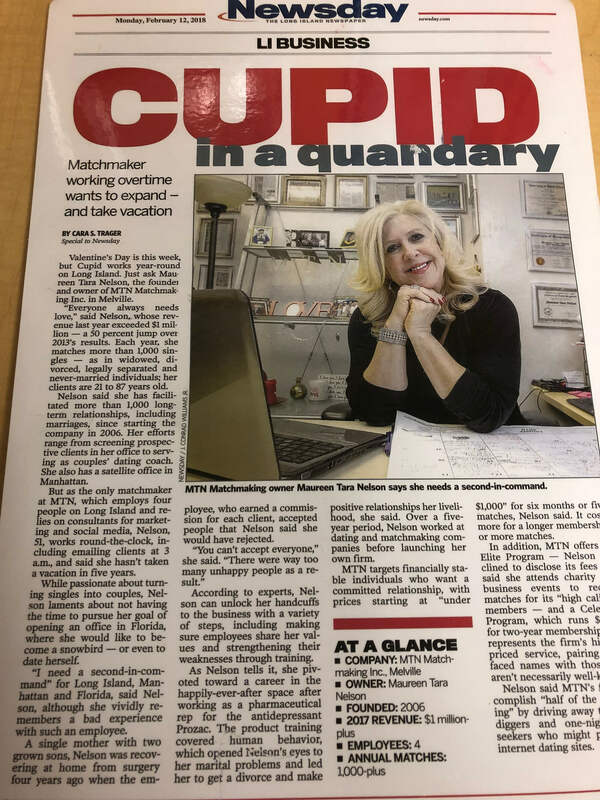 Look for more of Maureen’s articles and write-ups recently in Long Island Pulse (First Date Mistakes), The Boulevard (Tips on avoiding a disastrous Valentine’s Day). Hopefully you saw one of Maureen’s latest success stories on Channel 12 News, Love Stories, Valentine’s Day Segment! 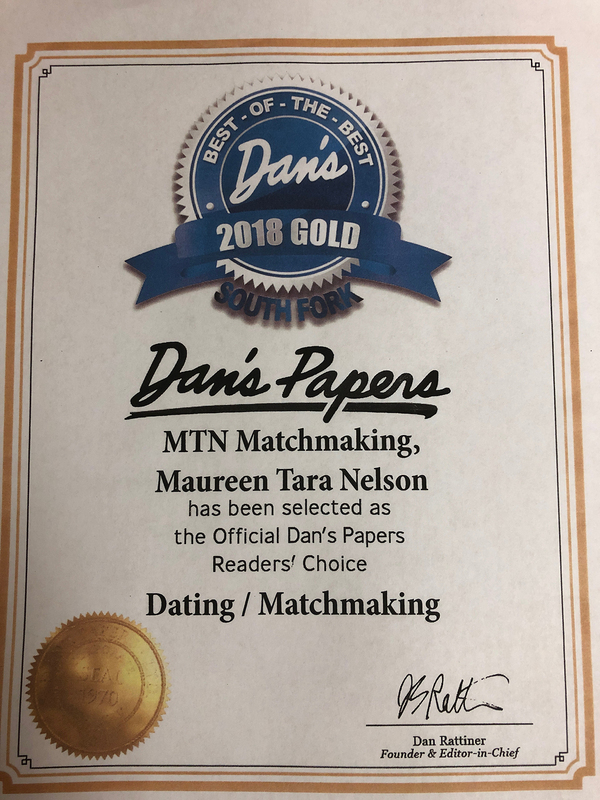 Recently you will find exciting Editorials on Maureen Tara Nelson Private Matchmaking in the Magazines and Newspapers of The Irish Voice, Long Island Business News and The New York Resident! In The Irish Echo, June Issue 2008, I was interviewed by THE BUZZ editor, Eileen Murphy, where she asked me over 20 personal questions about myself…you might be surprised by some of my answers! In The Home & Away Newspaper, Maureen talks about the two most ingredients in a relationship. 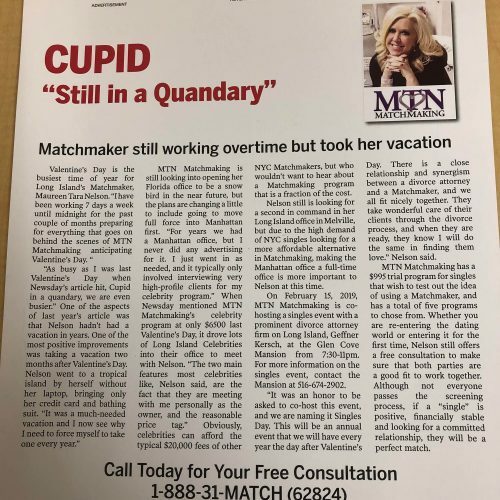 In The Irish Emigrant Paper, you’ll enjoy reading “Fall in Love this Fall Thanks to our very own Irish American Matchmaker. We WON!!! 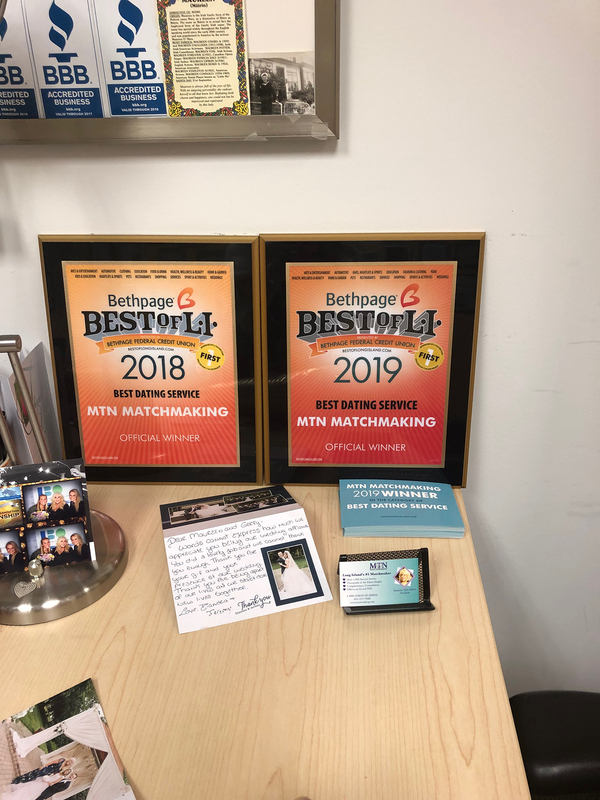 Thank you readers of The Long Island Press for voting us “Best of Long Island” Matchmaker for 2009. In Irish Voice, “Top Ten Most Romantic Gestures” for Valentine’s Day 2009. In Home & Away, Maureen talks about her own St. Patrick’s Day Memories…March 2009. In Natural Awakenings, April 2009, “Dating Advice given my Maureen Tara Nelson in her new Blog on Irish Central.com” for all of her Spiritually Minded clients. 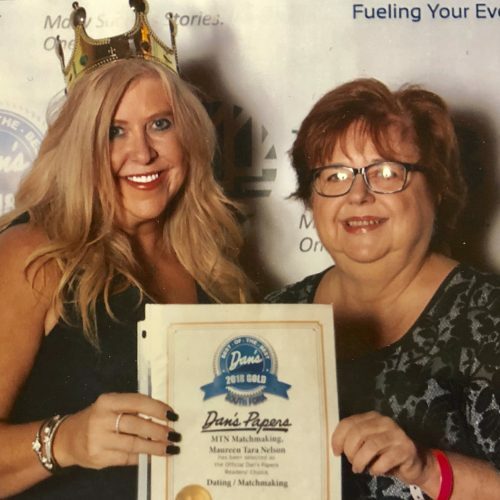 In Long Island Pulse, April 2009, Maureen Tara Nelson was awarded “Please Stand Up” for her success in Matchmaking for Doc’s Single’s Dance Parties. Monthly guest on Frankie D’s Radio Station, WGBB, the entire 2009! A free Match for Mom was featured in May 2009 The Irish Voice, compliments of Maureen Tara Nelson. 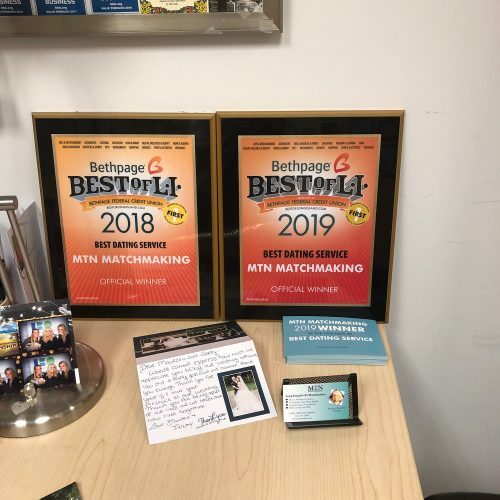 A free Match for Dad is being offered by Maureen Tara Nelson in Natural Awakenings. 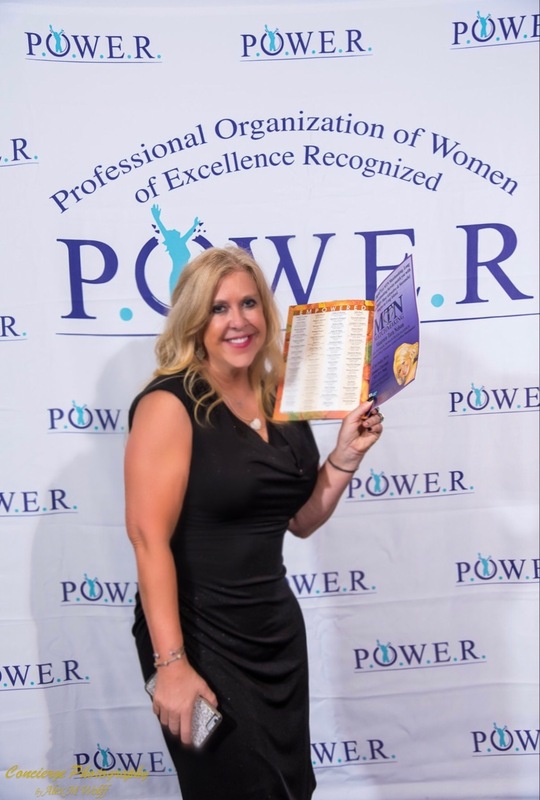 The Irish Voice chose Maureen Tara Nelson as one of their Top 50 Most Influential Business Women on Long Island. Meet Maureen Tara Nelson personally at Summer Singles Sizzle with taste at Grace’s Marketplace. It was a true pleasure to be invited to The end of summer party in August for The Irish Business Network, we had a wonderful time. 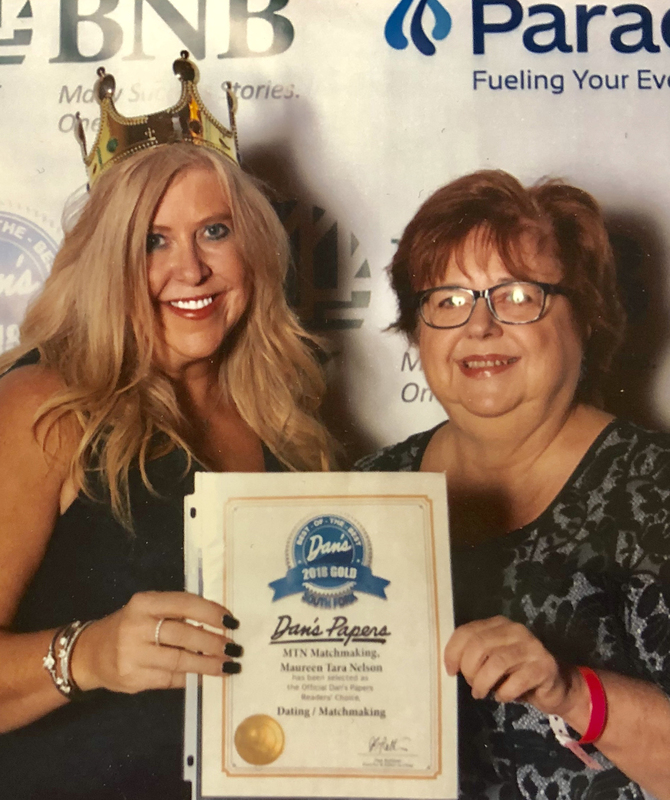 The staff at Maureen Tara Nelson, Private Matchmaking, Inc.
Long Island Fashion Expo, in October was pleased to have Maureen Tara Nelson be apart of their important cause. Maureen Tara Nelson made a presentation, how to meet Mr./Ms. Right the easy way,” once again at this year’s Annual Singles Expo – November 1, 2009. We WON AGAIN!!! 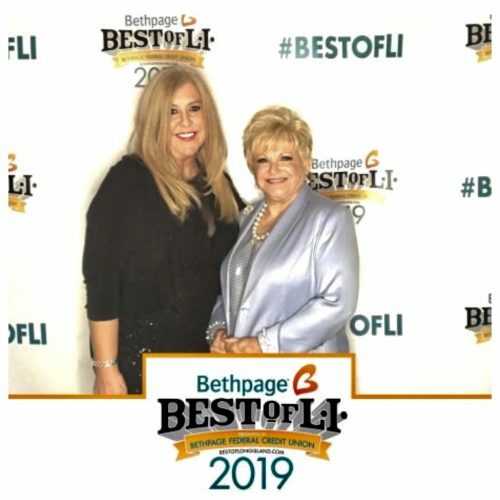 Thank you readers of The Long Island Press for voting us “Best of Long Island” Matchmaker for 2010!!! Quoted in Newsday, January 11, 2010, Maureen Tara Nelson gave her insight to the upcoming wedding of Derek Jeter. THERE WILL BE VALENTINE’S DAY EDITORIALS IN FEBRUARY 2010, in The Long Island Pulse, The Irish Echo, The Irish Voice, LIPress, Natural Awakenings, and more!!! Featured guest FEBRUARY 11, 2010 on Channel 12 News for their Valentine’s Day segment with Maureen Tara Nelson LIVE. Celebrity Guest Judge at the Famous Paddy Reilly’s for their Grand Finale of their Irish Version of American Idol. Guest speaker in March 2010 for The Woman’s Networking Group. Generations Summer 2010 Magazine, “Tips for a Great First Date” by Maureen Tara Nelson. Also appeared in the A&E series Growing up Twisted! August 2010, The Irish Echo, Maureen Tara Nelson answers the questions of their single readers. December 2010, We WON AGAIN !!! 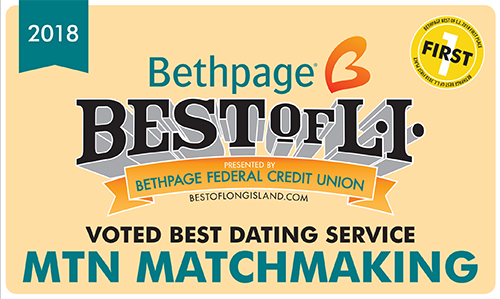 Thank you readers of The Long Island Press for voting us “Best of Long Island” Matchmaker for 2011. OUR THIRD YEAR IN A ROW WINNING!!! Finding love for Valentine’s Day 2015, Irish Echo Newspaper. Valentine’s Day articles 2011 & 2012 in Long Island Pulse, LI Press, Newsday, Generations, and Irish Voice. LI Business News February 2011, Feature article and Photo Shoot. In February 2011, Maureen Tara Nelson participated at the Annual Charity Day at Bloomingdales. She gave out free dating tips to all! 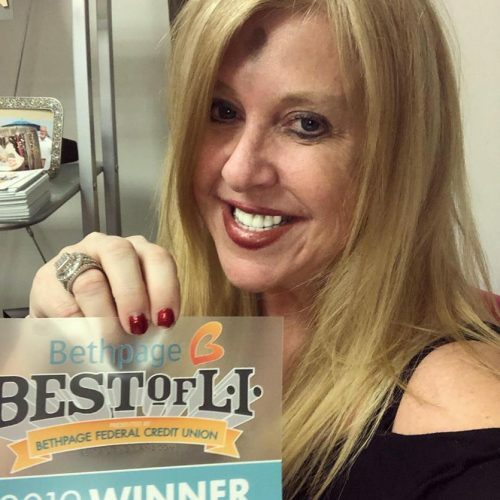 Singles Advice Columnist for The Levittown Patch! Irish Voice article on Maureen and The Millionaire Matchmaker, 2011. St. Patrick’s Day articles in The Irish Voice, Irish Echo, & The LIPress 2011 & 2012. 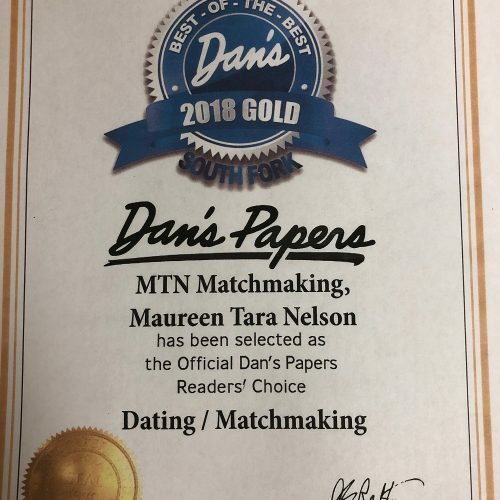 Verizon Fio’s Interview on Maureen Tara Nelson Private Matchmaking, 2011. 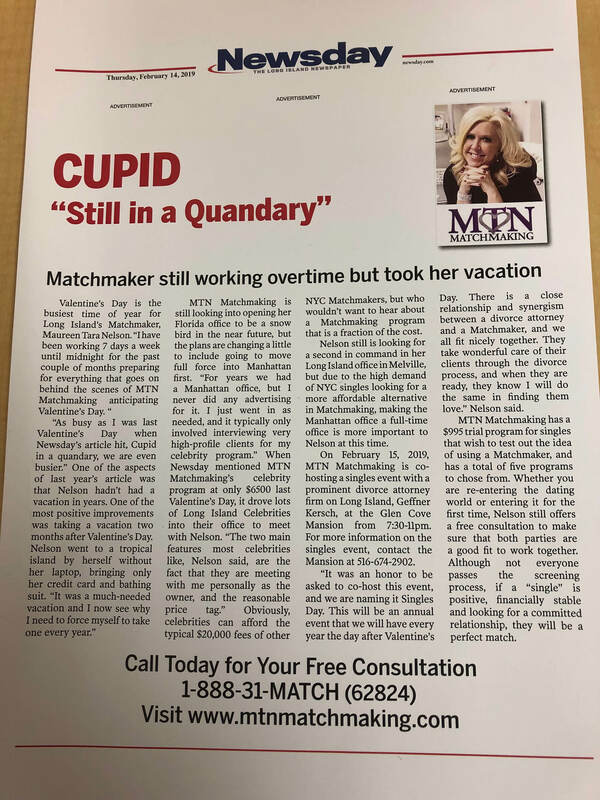 Huntington Buzz & Manhattan Buzz Singles Advice Columnist 2011. Appeared as herself on The Off Broadway Production of Miss Abigail’s guide to Dating, Mating, & Marriage! with Joyce Dewitt. LIPress 2011, The Five Best Outdoor Restaurants on Long Island. Levittown Patch, and NY Post. LIPress Winner Fourth Year in a row, 2012, The Best Matchmaking/Dating Service. LIPress 2012, Happy Valentine’s Day article to all singles in New York. LIPulse 2012, Valentine’s Day article. Irish Voice & Irish Echo, Finding Love on Valentine’s Day. Read the Levittown Patch for all Relationship advice in 2012. Milieu Magazine, Quarterly Matchmaking articles in 2012. Image Magazine articles, Matchmaking Then and Now, & The Second Time Around. Irish Voice 2012, Christmas Article, 12/27/12. Christmas Articles, 2012, LIPress, & LIPulse. LIPress Winner Fifth Year in a row, 2013, The Best Matchmaking/Dating Service. LIPulse 2013, Valentine’s Day article February 2013. LIPress 2013, Valentine’s Day article 2013. Filming upcoming A&E television show airing March, 2013. Summer Articles, 2013, LIPress, & LIPulse. LIPress 2013, Holiday Gift Ideas. 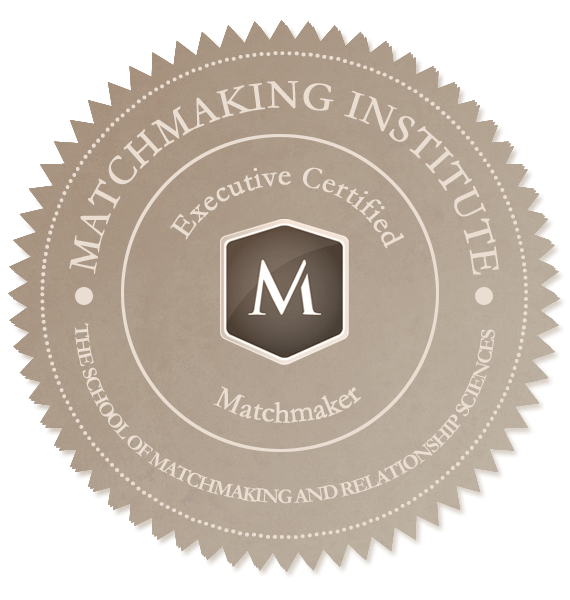 LIPress Winner Sixth Year in a row, 2014, The Best Matchmaking/Dating Service. LIPulse 2014, 7 Steps to meet your Valentine. Irish Voice February 2014, How to meet your Valentine. Great Love Debate Long Island, April 2014, Expert Panelist. Milieu 2014, Holiday Advice For Singles. 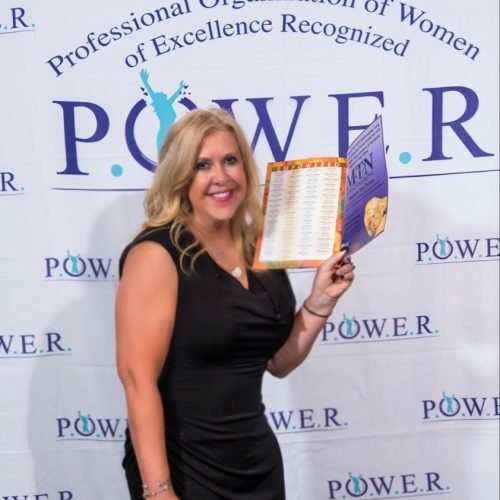 Maureen has a bachelors degree in Business Administration, Majoring in Marketing, and minoring in Psychology. 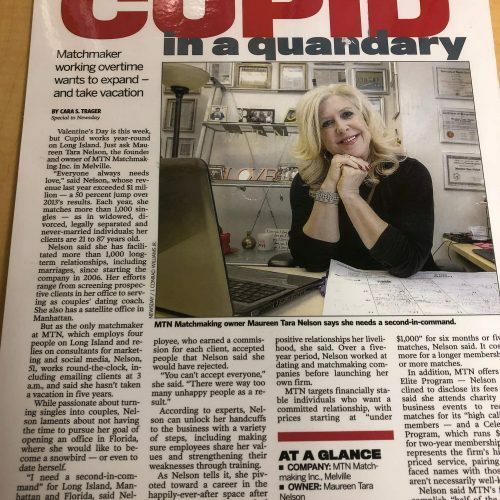 Maureen also was a Guest Professor for the day in Marketing at Nassau Community College lecturing on dating and relationships, has conducted a Seminar, “How to meet Mr./Ms. Right the easy way”, at the Long Island Singles Expo in October 2007. And in October 2008, “How to meet Mr./Ms. Right Part II,” and again Part III November 2009. 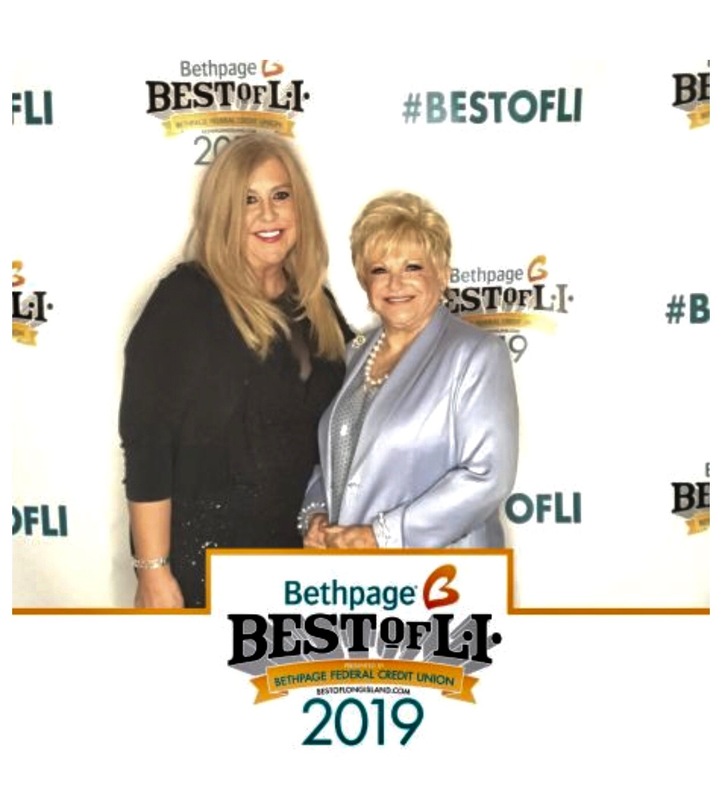 Thank you readers of The Long Island Press for voting us “Best of Long Island” Matchmaker for 2019.